Ali Sadeddin presents guidelines for the selection and use of chemical protective clothing. Exposure to chemicals can affect the entire human body, so it is necessary that we protect the body completely. The most sensitive parts of the body to chemicals, which can be effected more than other parts, are the eyes and respiratory system. However, the skin is considered the main place that chemicals can penetrate and affect the human body and health. The purpose of chemical protective clothing and equipment is to shield or isolate individuals from the chemical, physical and biological hazards that may be encountered during hazardous materials operations. During chemical operations, it is not always apparent when exposure occurs. Many chemicals pose invisible hazards and offer no warning properties. This article will describe the various types of clothing that are appropriate for use in chemical operations, and provide recommendations on their selection and use. It is important that protective clothing users realise that no single combination of protective equipment and clothing is capable of protecting against all hazards. With this in mind, protective clothing should be used in conjunction with other protective measures. Engineering or administrative controls, for example, to limit chemical contact with personnel should always be considered as an alternative measure for preventing chemical exposure. Before considering selection factors and purchasing chemical protective clothing, you have to conduct a hazard assessment. A hazard assessment may be conducted on a single employee performing a single task, or a group of employees if all the employees perform an identical task. Laboratory workers using similar types of chemicals, for example, could be grouped under the same assessment. Chemicals present a variety of hazards such as toxicity, corrosiveness, flammability, reactivity, and oxygen deficiency. Depending on the chemicals present, any combination of hazards may exist. Some chemicals can also be flammable or corrosive, in which case controls must be suitable for those hazards, too. Chemical exposures can occur anywhere: in industrial settings; on the highways, in residential areas; they may be either indoors or outdoors; the environment may be extremely hot, cold, or moderate; the exposure site may be relatively organised or harsh presenting a number of physical hazards. Chemical handling activities may involve entering confined spaces, heavy lifting, climbing a ladder, or crawling on the ground. The choice of ensemble components must account for these conditions. During the hazard assessment of each task, inspect the layout of the workplace and look for hazard sources such as chemical exposure, including airborne or skin contact that would have the potential to splash onto the skin or into the eyes, or the potential to breathe vapours or mists, or harmful dust or particulates. Many chemicals known to be harmful to health can be easily absorbed into the body. The respiratory tract is usually the major route of entry for chemical exposures. Another common source of chemical exposure is through contact with the eyes. Whenever this is a possibility, appropriate safety eyewear must be used. Chemical safety goggles are the only appropriate eyewear when handling hazardous liquid chemicals. Chemicals can also enter the body through the skin. In some cases, skin absorption may contribute a significant portion of the total body exposure to hazardous chemicals. Intact skin can be an effective barrier to many chemicals; however, minor cuts and abrasions can allow direct entry into the body. The skin can also be the target organ in the development of diseases such as dermatitis. Skin diseases can also increase the likelihood of absorption. Chemical Protective Clothing, or CPC, can be classified by design, performance and service life. Categorising clothing by design is mainly a means of describing which areas of the body the clothing intends to protect; for example, whether we need to use boots, gloves, aprons, jackets, coveralls, or full body suits. Categorising clothing by performance indicates whether it can be used for vapour, liquid-splash or particulate protection. The category of service life is mainly a means of describing whether the protective clothes are intended for single or multiple uses. The distinctions between these types of clothing are both vague and complicated. Disposable clothing is generally lightweight and inexpensive, whereas reusable clothing is often stronger and more costly. Extensive contamination of any garment, however, may classify it as disposable. If an end user anticipates that a garment will continue to offer adequate protection for several uses then the suit becomes reusable, especially if this cost will be lower than disposing of the PPE and purchasing new protection. The key assumption in this determination, however, is the viability of the garment following exposure. Before selecting and deciding on the chemical protective clothes to be purchased, the following factors must be examined. It is important to give attention to the clothing’s configuration, size, construction, components, comfort, ease of donning and doffing, mobility restrictions, and compatibility with other protective equipment. Ideally the used garments must resist permeation, degradation, and penetration by the respective chemicals. Permeation is the process by which a chemical dissolves in or moves through a material on a molecular basis. An acceptable material is one where the breakthrough time exceeds the expected period of garment use. Degradation involves physical changes in a material as the result of a chemical exposure, use, or ambient conditions such as sunlight. Penetration is the movement of chemicals through zippers, seams, or imperfections in a protective clothing material. It is important to note that no material protects against all chemicals and combinations of chemicals, and that no currently available material is an effective barrier to any prolonged chemical exposure. Garments offer wide ranges of physical qualities in terms of strength, resistance to physical hazards, and operation in extreme environmental conditions. The degree of difficulty in decontaminating protective clothing may dictate whether disposable or reusable clothing is used, or a combination of both. The firm or procurement team can specify clothing that meets specific standards, such as 1910.120 or the NFPA standards. As cost is not the final word for selecting the proper protective clothing, the firm or procurement team should assign the proper budgets and resources to obtain the broadest protective equipment they can buy to meet their specific application. There should be no compromise when it comes to health and safety. Choose hand protection that adequately protects from the hazards of a specific job and adequately meets the specific tasks involved in the job. Suitable hand and lower arm protection should be provided, and gloves used to protect against chemical hazards should be selected based on tested performance against specific chemicals. These gloves can be disposable or reuseable and generally do not protect against all chemical hazards. The appropriate glove material must be selected that provides resistance to the specific chemical hazard that will be encountered, such as acids, alcohols, oils, corrosives, or solvents. Incorrect selection or misuse of protective gloves can lead to skin disease including dermatitis, burns or serious ill health, not to mention wasting your money. Gloves cannot be ‘maintained’. The inside nearly always becomes contaminated the second time they are put on. Contamination works its way through the glove even while it is not being worn. For this reason, single use disposable gloves might offer better protection. Head protection must be worn when employees’ working environments host hazards that may affect the head, such as chemical splashes, entanglement, or objects falling/being dropped from above. Employees with long hair must cover and protect their hair with a hat, cap, net or bandana. Protective clothing needs to be provided only for the specific parts of the body that are exposed to the hazard. Depending on the hazards of the workplace, one or more of the following may need to be provided: vests, jackets, aprons, coveralls, sleeve protectors, full body suits. These items are intended to protect the wearer against moisture, toxic chemicals and acids. Workers should wear clothing under coveralls. Two layers of clothing will reduce the amount that gets through to the skin. Coveralls impermeable to air can give high levels of chemical protection, but can draw dusts and mists inside the clothing at the neck, arm and ankle. Protective clothing should be used, cleaned and maintained in accordance with the manufacturer’s instruction. 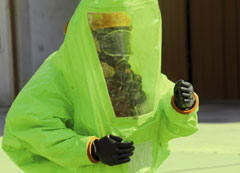 Single use protective clothing should be disposed of as hazardous waste at the end of the particular job or task. Appropriate eye and face protective equipment must be worn at all times in working environments where eye and face hazards exist. Face shields should be worn to protect the face and the front of the neck from flying particles and sprays or splashes of hazardous liquids. Face shields and chemical splash goggles are required when working with larger quantities of corrosive chemicals and/or a high probability of eye and face injury exists. Chemical splash goggles are required when working with smaller amounts of corrosive chemicals and where a reasonable probability of splash exists. Employees may be exposed to airborne hazards that require the use of respirators. The purpose of a respirator is to prevent the inhalation of harmful airborne substances and/or an oxygen-deficient atmosphere. Functionally, a respirator is designed as an enclosure that covers the nose and mouth or the entire face. If workers wear full-face respirators that also provide eye and face protection, ensure that this is included in the manufacturing standard. Protective footwear should be worn in areas where there is a danger of foot injuries due to exposure to chemical hazards. There are at present no standards for chemical protective footwear. Some chemicals penetrate leather very easily. Tell your supplier which chemicals you are using. Wear wellington boots if chemicals or products could come into contact with the lower leg or drop into shoes. Shoes with tread composition and tread pattern designed to give better traction than standard shoes on slippery surfaces should be worn to prevent slips and falls in wet environments. Rubber or neoprene overshoes are designed to protect against splashing liquids or chemicals. The final selection of all types of protective clothing should be made with the involvement of the end users and after their proper feedback. The PPE should fit and be comfortable. Uncomfortable or ill-fitting protective clothing is less likely to be worn by the employee, and will therefore be less effective when needed. Having a safe and healthy working environment is everyone’s responsibility, but it must start with top management and executives. Health and safety should become part of the organisational DNA and firm’s culture. While maintaining a safe working environment is the responsibility of the CEO and high management, complying with safety procedures and policies is the responsibility of everyone in the firm. Employees have to follow the instructions and guidelines related to health and safety within the organisation. Supervisors should ensure that all employees are trained on using the proper PPE related to the associated hazard. Laboratory personnel must be instructed to remove gloves and lab coats prior to entering common areas such as hallways, elevators, eating areas, rest rooms, and offices. Each employee should demonstrate an understanding of the training and the ability to use PPE properly before being allowed to perform work in hazardous environments. I end my article with a checklist that is useful for implementing the use of PPE in the workplace. This checklist is adapted from Stony Brook University’s PPE Selection Guide. 1. Has a workplace survey been conducted to determine which PPE items are necessary? Is this documented? 2. Are annual task analyses completed for employees requiring PPE? 3. Has a process or chemical change occurred that requires additional levels of PPE? 4. Were employees notified and training provided? 5. Is PPE available in a variety of sizes as needed by employees? 6. Are employees trained on the purpose of PPE and the hazards the PPE will protect them from? 7. Are employees trained on the procedure for reporting damaged PPE items to the supervisor? 8. Are employees trained on the use and limitations of the PPE? 9. Have employees been trained and tested on how and when they are to use PPE? 10. Are employees’ training records maintained, up to date, and accurate? 11. Is all PPE maintained in a sanitary condition and ready to use? 12. Are temporary or rotated employees, vendors, and visitors advised on the correct use of PPE? Are they required to wear PPE while in the work area? 13. Has your MSDS information been surveyed for required PPE? 14. Are procedures in place for decontamination and disposal of PPE? 15. Are PPE items for reorder verified for the same level of protection when there are changes in manufacturers? 16. Are adequate levels of PPE items maintained on site or accessible to employees when needed? 17. Is PPE available at no cost to the employee? 18. Are gloves, aprons, shields, or other means of protection provided where there is a risk that employees could be cut or exposed to corrosive, hazardous or infectious materials? 19. Are procedures in place for cleaning up hazardous materials, including PPE decontamination? 20. Is contaminated PPE disposed of in an approved manner? 21. Is reusable PPE cleaned and inspected before reuse? 22. Is reusable PPE inspected for normal wear and tear before each use and discarded as necessary? 23. Is disciplinary action initiated when employees refuse to wear or otherwise damage PPE?